At Café Scientifique, last night, I heard Dr. Stephen Cartwright speak on ‘Homeopathy – Dispelling myths and establishing facts’. I had never been to one of these CafeSci evenings, but going from the description, I was hoping there will be many who will be interested in hard scientific facts and theories. Even then, I took a print of the Sense about Homeopathy poster published by Sense about Science, just in case anyone might be interested in knowing more about it later. But within the first few minutes of the talk, I knew I would not need it. Dr. Stephen Cartwright, is a molecular biologist who, with support from private donations, started researching homeopathy in 2009. Prior to that he trained and setup his own business as a homeopath in Oxford in 1988. Last night, he began his talk with a story about how he first got into homeopathy, and that is when I neatly folded my Sense about Homeopathy poster and put it in my bag. In 1984, he visited a homeopath, out of curiosity. After talking to the homeopath, he was prescribed some pills which he happily took; only to develop symptoms of sinus within 24 hours. That intrigued him and he took up the study of homeopathy. 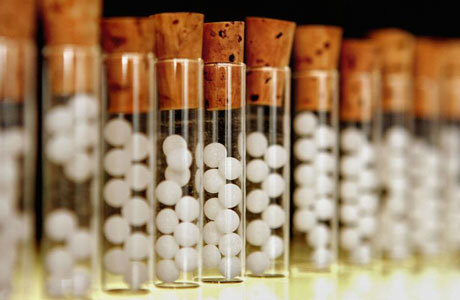 ‘After 20 years of practising homeopathy, I really wanted to understand the chemistry behind these remedies and that’s why I have put a lot of thought and came up with some experiments to gain some insight. He continued, ‘I will have to delve into some chemistry, please forgive the jargon.’ He goes onto explain his experiments. ‘It is well known’, he says, ‘that homeopathic potencies are affected by sunlight and magnets’ and thus of all the analytical techniques that man has invented to understand the chemistry of atoms he could only use was visible light spectroscopy. Process: In a special cuvette, he mixes a drop of his potencies with 90% ethanol and measures absorption against a control. Control that he uses is non-succussed water, because homeopaths accept that water that has not been methodically shaken does not have any homeopathic remedy in it. The potencies which could be of various dilutions contain a poly substituted phenol. ‘More details cannot be divulged as it is a patentable finding’, he says. Wow! A Nobel Prize deserving discovery, why hasn’t he published it? Oh wait, there is a problem. Problem: Results are not reproducible because too many factors affect his experiments, factors like time of the day, place in the lab, how many times was the potency shaken, etc. He also observed that when very rarely he has managed to have all the factors in control, he found that on somedays he got the result and on somedays he did not. So how to explain another strange pheonomenon? Of course, another theory. He hypothesises that there is an oscillation in the potency. On somedays it shows effects and on somedays it does not. Enough of the talk, let’s move on to question answers. I’ll enlist the ones I remember. A: Perhaps, I don’t know, there has to be some way to explain this strange phenomenon. May be it is true. A: As far as I know, they were regular. Doesn’t that mean that you can then time clinical trials on the days you know the remedy will have a cure!! tracyclines are compounds made to combat disease. Making potencies that way is against the homeopathic principles, right? Homeopaths make potencies of things that cause the disease, right? Oh yes, we make potencies of tetracyclines to combat the side-effects produce by this drug. I like this ‘no intelligent questions’ comment. Look forward to seeing these papers of his, should they ever materialise, and what comes of collaborations! Were details actually exchanged – do you think he’ll get in touch?? I think if he does not get in touch, I am sure chemists from Oxford will do. But frankly, all that might not hold much water because he did not seem to have a handle on the scientific method. I don’t know if he has kept a good enough record of what he has measured. It might just be as dodgy as his talk. A quick note – this is where his some of his effects might be coming from – he uses unsuccessed water as a control. “Q. Considering that the potency is shaken in 90% ethanol and your claim that with more shaking you observe more absorbance. Is it possible that ethanol is simply dissolving glass or some impurities that are present in glass? Thanks for the link. It makes sense. It was published so recently, he should know about it really. Considering it was published in a journal called HOMEOPATHY! ” Problem: Results are not reproducible because too many factors affect his experiments, factors like time of the day, place in the lab, how many times was the potency shaken, etc. He also observed that when very rarely he has managed to have all the factors in control, he found that on somedays he got the result and on somedays he did not. So how to explain another strange pheonomenon? Of course, another theory. He hypothesises that there is an oscillation in the potency. On somedays it shows effects and on somedays it does not. If it is indeed difficult to reliably reproduce the results, as described above, it’s curious that homeopaths rarely report such problems. This observation would be consistent with the hypothesis that he is just ‘measuring’ noise, rather than any actual homeopathic effect. Noise it must be. I hope he reads this. I very much appreciate your writing this excellent post, which I have linked to from my own, not least because you’ve saved me the bother of transcribing my notes from the same presentation he gave at a conference I attended. I’m glad I could help. Your post is very interesting. Ahaan. What are you talking about? I could not find the terms on google. Can you give me a link? Be careful what you wish for akshatrathi. Nancy trolled this forum so bad she was given her own section on it. She posted hundreds of worthless links to quack websites before she was finally banned. I visited a homeopathic lady doctor who had opened a clinic in her home itself. I was surprised to find a young girl assisting the lady doctor with her work in her clinic. She is still assisting the lady doctor. When I entered the room, I found there was no privacy at all to talk to her about my problems. The door was open with only a curtain to cover the entrance. The two windows were open, one of them was for air cooler while the other was open for her husband to keep an eye on her from their drawing room. The lady doctor sat near the door which was closed from inside and provided entrance to the rooms inside the house. Her sitting position was next to this door, while the patient sat near the door. Thus in case her husband wanted to listen to what the patients were saying he could easily listen to it, because he is at home during the working hours of the clinic i.e. 6 p.m. to 9 p.m.. He works in K.D.K college nagpur during morning hours. The lady doctor never touches the patients to check their pulse while other doctors in her profession are found doing so, without hesitation and on purpose. This lady doctor happens to be a Brahmin, so may be her religion doesn’t permit touching the people of lower caste. When her husband found that the number of male patients attending the clinic is increasing he sent his daughter to keep an eye on his wife. So now the lady doctor and her daughter who is studying in fourth standard both listen to the patients’ problems. A patient finds it awkward to talk to the doctor in presence of her daughter, but does not complain about it. A patient fears that the lady doctor may get annoyed and give him a medicine which may harm his health in the long run. The lady doctor tries to justify the presence of her daughter in the so called cabin by treating her as her assistant. However when her daughter whispers in this lady’s ear and she laughs like hell, then it is natural for a patient to feel ashamed of having spoken about his problem. I thought that doctors were supposed to be the noble people to whom a patient can tell all his problems without any hesitation to get himself cured of his illness. But when these mother and daughter make a laughing stock of the patient’s problem I really wonder how come a doctor can compromise the privacy of his patient for the sake of educating her child or whatever may be the reason. Is it actually permitted in medical profession in India. In case it was improper for a doctor to compromise the privacy of the patient for the sake of educating her child studying in fourth standard and any action can be taken against such doctor.